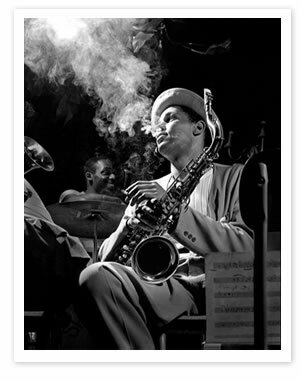 Dexter Gordon. Photo by Herman Leonard, courtesy of Lush Life Gallery. A day after San Francisco celebrated the Giants’ World Series victory with a ticker tape parade, reminders of their triumph remained. A huge orange-and-black banner declaring “Go Giants!” hung from Macy’s façade while sidewalk vendors by the Hotel Monaco near Union Square hawked t-shirts heralding the victory. I’d come to the Monaco for a few days to research secondary education in the city’s Mission district, catch a one-man show on Woody Guthrie at Studio 250, sample the downtown nightlife, and take a spin over the Golden Gate to Marin County for a visit in San Rafael. The Monaco, a boutique Kimpton hotel on Geary Street was a delight. On the day of my arrival, I made it down from my sixth-floor suite for the daily wine reception at 5 p.m. In a high-ceilinged room off the lobby, where the fireplace blazed, we sampled Twisted’s hearty 2008 Old Vine Zinfandel and its 2009 Pinot Grigio. The wine helped me unwind after a long day of coast-to-coast travel. So did the free, 15-minute chair massage by Brian Dudley, whose blend of Shiatsu and myofascial massage released the day’s tensions. I completed my entry into that very mellow California state-of-mind with a satisfying soak in my room’s Jacuzzi whirlpool before heading out to explore. That night, I went up Geary to the Fillmore neighborhood, where the jazz scene flourished from the mid-1940s to the late 1950s, with Billie Holliday, Dexter Gordon, John Coltrane and Ella Fitzgerald often playing in local clubs. Then came the explosion of rock in the neighborhood in the 1960s, with Jerry Garcia, Janet Joplin and The Doors playing to sold out crowds at the Fillmore Auditorium. Music still flourishes in the Fillmore neighborhood. Live Nation now owns the famed auditorium, and books top acts. Within a couple of blocks on Fillmore Street, you can hear jazz and r&b at Rassela’s, kick-back for standards at Sheba’s Piano Lounge, or dig in for some down-home blues at the Boom Boom Room. There was a touch of ‘60s nostalgia on Fillmore at Yoshi’s jazz club and Japanese restaurant when I visited in early November. Performing that night was pianist Ray Manzarek, a mainstay with The Doors in the 1960s, who has since moved on to jazz. Before an audience comfortably listening in tiered seating at the intimate club, Manzarek played complex duets with guitarist Roy Rogers, flavoring the evening with a few rifts from the songs he first played more than 40 years ago. If you’re stopping at Yoshi’s, don’t miss the Lush Life Gallery, also located on the first floor of the 13-story Fillmore Heritage Center, a mixed-use development that includes the club and the Jazz Heritage Center, where the gallery features jazz-inspired art exhibits. In previous trips to San Francisco, I’d gotten around without a car, taking the user-friendly BART system from the airport to downtown, and getting around by subway, bus, cab, or by walking up and down the San Francisco hills. You can get your workout just walking around. This time I rented a car for a visit to Marin County. While overnight parking downtown can be stiff – from $28 to $49 – driving around the city, and over the Golden Gate proved a breeze. The large-scale street signs alerting you of upcoming intersections – before you get there – is one of the most car-friendly amenities for visitors I’ve seen. The one-way street patterns also provide easy navigation. 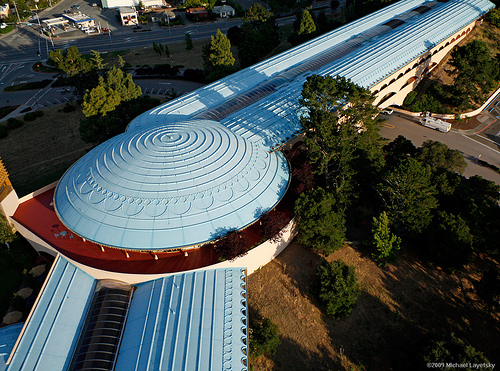 Frank Lloyd Wright designed the Marin County Civic Center. The car propelled me over the bridge for a visit with my cousin in San Rafael, the lovely small city in Marin County, about 15 miles north of the bridge. It has a thriving downtown, with coffee shops, restaurants, clothing stores and the Folk Art Gallery, where I bought some Christmas ornaments hammered from tin in Mexico. One night, we dined at My Thai on Fourth Street, sampling spicy curry and noodle dishes. The next morning, we stopped by the farmer’s market at the Marin County Civic Center, the Frank Lloyd Wright-designed complex with a blue roof that stretches along a ridge overseeing a parking lot teeming each Sunday morning with produce and bakery vendors. I drank sweet, warm Chai tea and munched on chocolate croissants, and my cousin made the rounds, loading up on greens and vegetables for the coming week. I would have liked to stay, but duty called in New York, and my plane was leaving the next morning.